An inquiry is under way into the deaths of two teenage girls who were hit by a train as they used a pedestrian level crossing in Essex. The 14-year-old girls were hit by a Central through-train heading from Birmingham to Stansted Airport on Saturday morning. 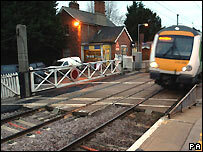 It is believed they were going to catch a Cambridge-bound train at Elsenham station in Essex. 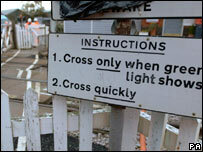 Network Rail said it believed warning signals at the crossing were working. The father of one of the girls said she had celebrated her 14th birthday last Monday. He said the details of what happened were still unclear. "We haven't been told the exact details, it's just a tragic accident. She used the crossing most days." He went on to pay tribute to his daughter. Her name is not being released until all family members have been told. "We - her father, mother, stepmother, sister and brother and the rest of the family are devastated by her loss - we are already missing her," he said. One of the girls was thrown hundreds of yards by the impact of the train, the Essex Ambulance Service said. Spokesman Murray Macgregor said: "They are likely to have died almost instantly. "Our hearts go out the families - to lose a child at any time must be absolutely devastating but to do it four weeks before Christmas makes it 10 times worse. "All our crews that attended found it a very difficult job, just because of the nature of it, the fact that two young girls have died. It's just terribly, terribly sad." A Network Rail manager said: "It is my understanding that two witnesses saw the red lights flashing and the warblers were going when the girls tried to cross. "Their train from London Liverpool Street to Cambridge had already come to a halt on the other side of the platform. "It appears they didn't realise another train was coming and stepped out a couple of feet." The train involved was the 0724 GMT from Birmingham New Street station. It would not have stopped at Elsenham, but calls at Cambridge, Audley End and Stansted Airport. The type of train was a class 158 Super Sprinter with a maximum speed of 90 mph. The speed it was travelling at the time will be part of the investigation. A spokesperson for British Transport Police said they were treating it as a tragic accident.